Sue's Idol - Hypocrites And Mad Prophets. Anthem sung by child, after - not by child... that's American Nation, the story tells about various guises of the American nation. We Walk Alone, rhythmic and brisk steps forward, despite the loneliness. Pace without fear to upcoming events. Don't be afraid of all from the past, be afraid of what can come in the future, Here Today Gone Tomorrow slow, close to a ballad song tells thats so sad and simultaneously hopeful! Melancholy, lyrical and epic ballad Alone. Look around while listenin' - maybe you're alone not forever? Reminiscents something , and even the first words remind ... but there if no comparison - there is no difference! Parabellum Bonecrusher starts like ballad with confession monologue and acustical guitar speaches to you, then sounds becomes tighter and a litle bit faster... not reminiscent! The denser beginning, with a viscous obsessive guitar opens We Are The Blood, repeated in chorus, that way repeated and continued. Nothing and nobody is perfect in the world, even Devil Needs A Fix. Patch of this phenomenon occurs slowly, at an average pace. World On Fire opens by the grim monologue, which occurs 'till middle while instruments slumbered... and flows all time like a balla-type song. 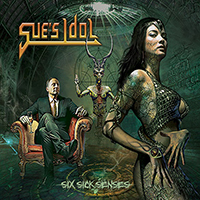 Sue's Idol - Six Sick Senses Title track Six Sick Senses opens the gates for demons of that story, intro with a strange speaches, then wonderful and jagged guitar peart sound 'till vocal joins and not hide away beneath them. Vicious tight start with hammerin' drum beats of DMO turn on your fear and force to use your mind. Denser! Tighter! Mightier! Halls of Mourning drives into the realm of heavy-weighted sounds! Bellicose chants, shamanic dances begins the Scion Pariah in this way forward to slow down bridge, then - warlike again 'till the chorus, that repeat track title many times! The orchestra plays a symphony and then - Kill or Be Killed joins with all band to show that way of life. Midtempo, darkly astringent consciousness Luna Sees can't resume you into other world without strange perverted words... listen, or you can't go away! Racer or pilot? Metal Octane on how to properly hold the handlebars, steering wheel, joystick, and how correct to press WASD! Bleak vicious all its length Gears of War suggestive of activity in the future - something needs to be corrected ...in the Conservatory! Whether tried the Taste This Evil? Evil... can't be tasted and forget about it, that's not like bad food...that's EVIL! A Minor Requiem ballad, sad, melancholic, with the accompaniment by keyboards, piano and not without organ Lady Painted Death starts like darker painted ballad, accelerated in the middle to midtempo track completes the album with darkness flashed by light, evil instrumentals, with echoes of melodies.